Would you rather have a constant week-long case of the sneezes or the hiccups? What would you each come up with if you sketched what you look like when you roll out of bed in the morning? Take turns filling in this special journal for best friends and find out! music, love, family, school friendship, and so much more! When you’re done, you’ll have a unique keepsake filled with words and pictures about YOU and your BFF to save and treasure forever. 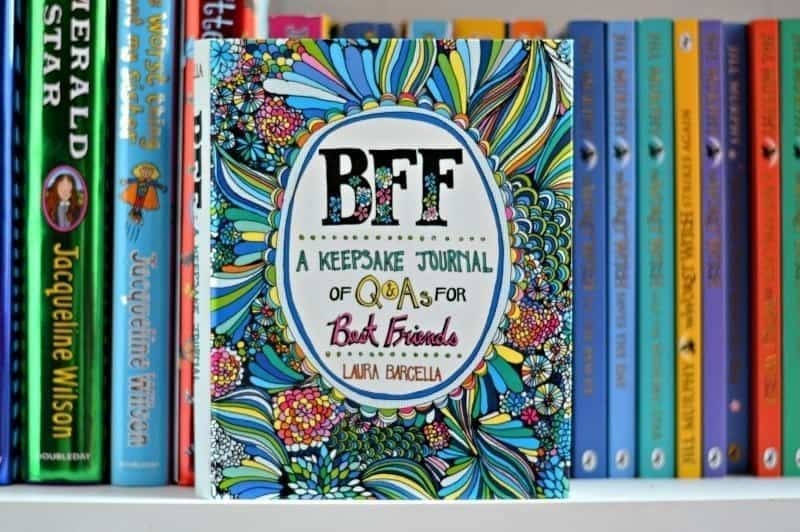 The BFF: A Keepsake Journal of Q&As for Best Friends is a great book that offers tweens and even teens the opportunity to record everything about their best friend forever. From what song would represent their life, whether they are a night owl or prefer to go to bed early, listing their crushes and planning the perfect sleepover party. Boo Roo and Tigger Too’s thoughts…. With Roo fast approaching the tween years (although if you heard her speak you would be convinced she was 8 going on 18 sometimes) friendships are becoming more important in her life. As a child I never kept a diary and in many ways I wish I had, the opportunity to recall friendships, crushes, likes and dislikes – albeit that I might be cringing as I read back through it. The BFF: A Keepsake Journal of Q&As for Best Friends has given Roo the opportunity to start recording all the important questions, the silly questions and fun facts about herself and her BFF. I really love this book and would happily purchase it for some of her friends birthdays. To celebrate the release of BFF: A Keepsake Journal of Q&As for Best Friends, Boo Roo and Tigger Too are lucky enough to have one copy to giveaway. I met mine at school! I was in high school and another girl I knew at the time was friend with Rachel (my know BFF) and we just got chatting one day out of chance.. the rest is History! We worked together and were expecting children at the same time. Through work – it hasn’t been an easy relationship but I wouldn’t be without her now. I met my best friend at school. My first job, she had started a few weeks before I did. the first day we started secondary. My best friend is my twin sister i met her in the womb. We met when I was 15 and starting my first job she had been there for a few years already. I met one in college (or university as you call it) and the other early in Girl Scouts. At school, and we are close to this day. I met mine on the interweb in 2005 and yes I married him! I met my BFF at secondary school, and we are as close as ever! She lived next door when I was little! I met her on my first day at nursery school, and we’ve been friends ever since. When her dad died, I adopted his cat for her, because she had a young child who would have wanted a kitten to play with, and her dad’s cat is a senior (18!). I’ve been sharing photo and video updates with her of how the old gal has been getting on since moving in with us, as we live in different cities. We’re so close we feel like family. I met my best friend over the Internet when I advertised for a flat ate to move into London with…………I was watching a movie and he knew all the songs from it etc etc we chatted for hours and 15 yrs later he has been everything to me from my bridesman to my children’s surrogate uncle! We worked together in a pub almost 15 years ago. I’d been dumped by my boyfriend and she came and asked if I fancied a girls night out to help get over him and I’ve never looked back. We joined the Army on the same day!